A stainless steel milk pitcher is needed when you froth milk with the steam wand of an espresso machine. 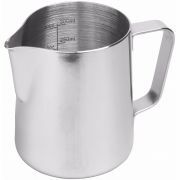 The size and form of a milk pitcher makes it easy to work with the steam wand, and you can feel the optimal temperature through the stainless steel pitcher. For producing perfect micro foam and making latte art, a good milk pitcher is also essential. However, learning the correct texture and getting the correct technique requires a lot of practice! The most popular size is around 350 ml, which is good for one cappuccinos or one smaller latte. The pitcher is filled up to 1/3 of the size, giving room for the milk to swirl and expand when steamed.